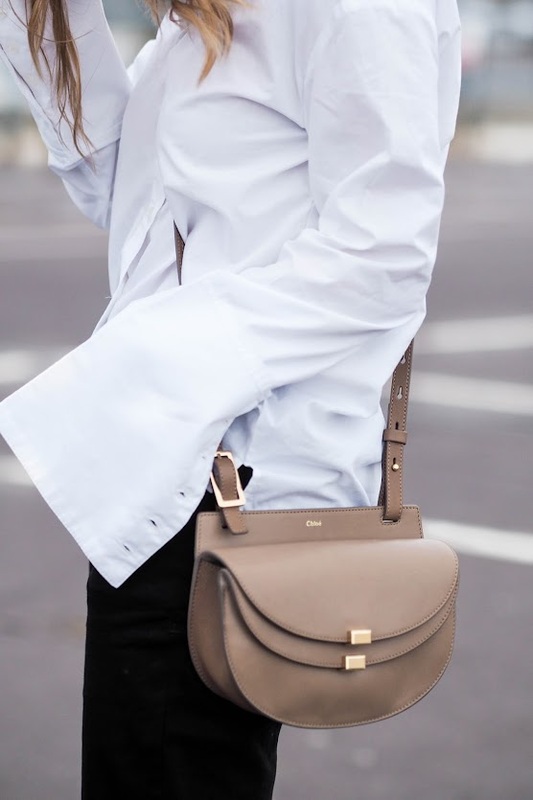 I've been on the hunt for a white flared sleeve shirt for months after seeing my favourite Australian bloggers sport the Anna Quan monogrammed shirt all over Instagram. The boyfriend fit and extra long cuffs has been something I've been scowering the high street for but with no prevail. I turned my search to the internet to find this flared sleeve shirt with the most incredible drop shoulders featuring a slit to the cuffs-the dream! It may not be monogrammed but for £25 I think I'll survive.. I'm now wishing I bit the bullet and ordered the blue version, too. This shirt will suit any look, we all know how versatile a white shirt can be so I know I'm going to get tons of wear out of it-Fashion Week included! New York, I'm ready for you. Awesome look! love your coat! That Chloe bag is so beautiful !! This is really stunning. I just love your looks and your dressing style and specially I love your white shirt and this trendy and designer hand purse. My love toward my husband hurts, since the day I took the risk and confronted one of his mistress, life was unbearable and it was clear he loves her more than me because he totally changed, and fought with me for confronting her instead of apologizing to me, he left the house for two weeks, froze my account and even served me with a divorce papers through his lawyer. I didn’t know it will get to that, I was disappointed and lost hope on trust, I thought I could have let them be, so I can save my marriage, I was at the verge of losing everything including our house. I needed to do something because I was almost running crazy, no chance to chill, I had only one option to find instant solution before it all disappears. I searched everywhere I could until I met Dr. Ogudugu on the internet with this email: (GREATOGUDUGU@GMAIL.COM), people really talked good about him and I was bold to ask him for one. Well, am glad he did at the end my husband came back on his knees, after the spell, begging for forgiveness. From what I have studied lately, my husband has indeed changed and become lovely. We never mentioned or even thought about divorcing again. Am so grateful for Dr. Ogudugu’s help.